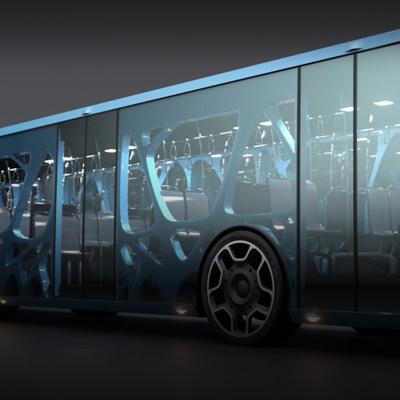 When protecting trains and buses, there is no room for compromise. That’s why locomotive and bus operators and refinishers trust Aqueous Guard® Rail for a top performing, innovative ceramic clear coat that is designed to protect assets under the harshest of conditions, so your assets spend less time in the spray booth, and more time on the tracks. 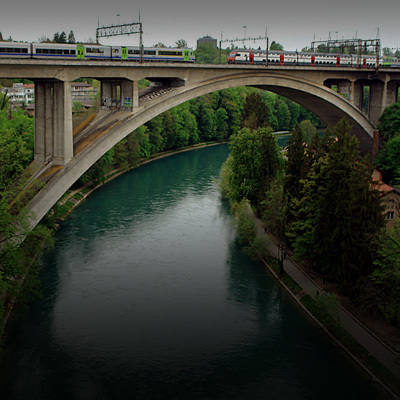 Superior durability, combined with consistent premium quality, results is why Aqueous Guard® is the leader for the rail and bus industry. 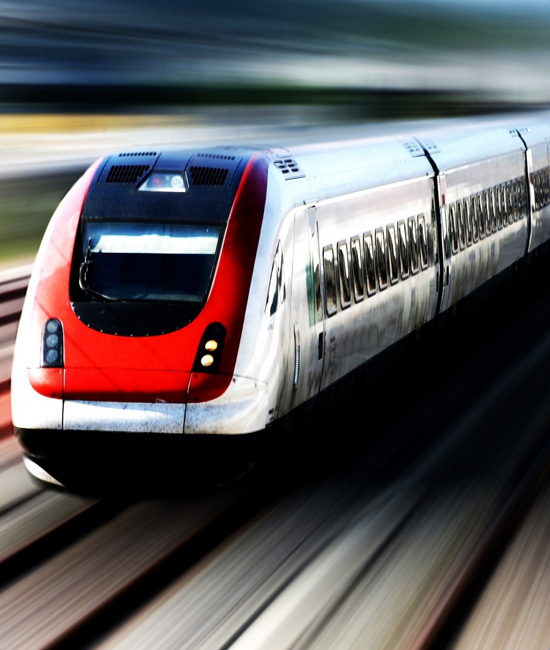 Tests confirm that no competitive ceramic train clear coat system outperforms Aqueous Guard® Rail for gloss retention and impact resistance. 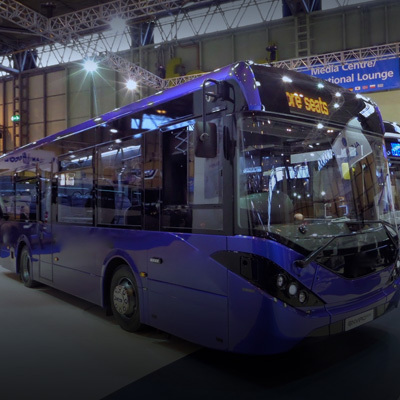 Aqueous Guard® Rail is designed to work on both exterior and interior surfaces, from bug splatter, to a marker pen, using Aqueous Guard® Rail really does keep your asset like new. Aqueous Guard® Rail has been tested and proven to reduce cleaning times and make graffiti fast and simple to remove. 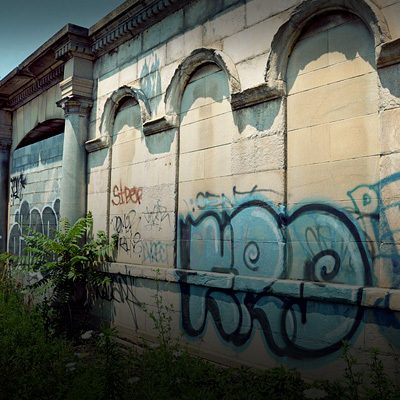 Harsh chemicals can become a thing of the past for cleaning and graffiti removal. Even train washes can simply use a pH neutral wash rather than harsh acidic solutions. Want to trial it first? No problem, get in contact and we can arrange free small trials or larger paid trials to show the benefits of Aqueous Guard® Rail. At Aqueous Guard® we understand the challenges and importance of maintaining a graffiti-free surface. Fortunately, Aqueous Guard® Rail is an anti-graffiti ceramic clear coat to help protect your assets. The ceramic clear coat has excellent cleaning properties to both paint and glass that resists not only graffiti, but dirt, airborne contamination, acid rain, diesel soot, oils and chemicals. Graffiti is easily removed leaving no marks behind. Applying Aqueous Guard® Rail enhances your assets and prevents vandalism from destroying the paint and livery applied. Down time is reduced to a minimum, as the graffiti is removed in an instant, returning the carriage to its former glory. Trains travelling at high speeds has its risks, using Aqueous Guard® Glass Coat reduces one of these risks by keeping the screen clear meaning the operator can see obstacles approaching sooner. 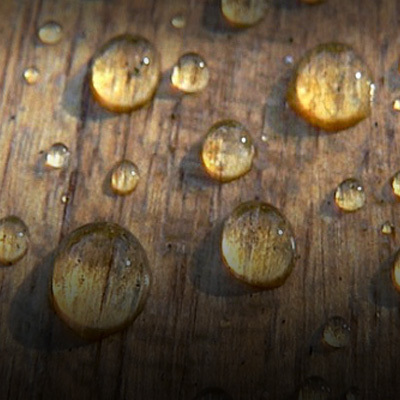 The highly hydrophobic coating removes the rain water instantly, keeping the screen clearer. External studies have proved that Hydrophobic coatings increase the reaction time (MITstudy) and decrease fatigue. 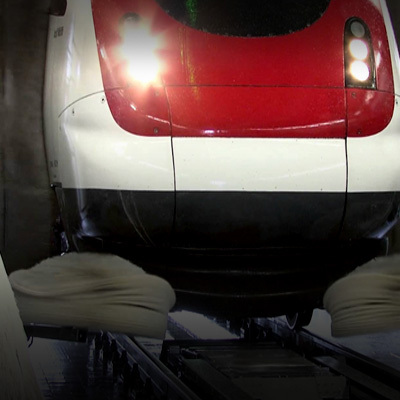 Whether it’s a new build or refurbishment of an existing train Aqueous Guard® Rail can preserve and protect all surfaces including, bogies, under-frames, below solebar equipment, roofs, exterior body-shells, glass and interiors surfaces. Aqueous Guard® Rail comes with HL1, HL2 and HL3 approval meaning it can be applied to surfaces both overground and underground. For more detailed information on this please contact us. As the coating provides a high gloss finish, polishing of carriages is no longer required meaning just a simple clean is needed. This improves Health & Safety with maintenance crews spending less time working on and around the carriages and tracks. Unipart Rail and Aqueous Guard® work in partnership to provide a quality service second to none. 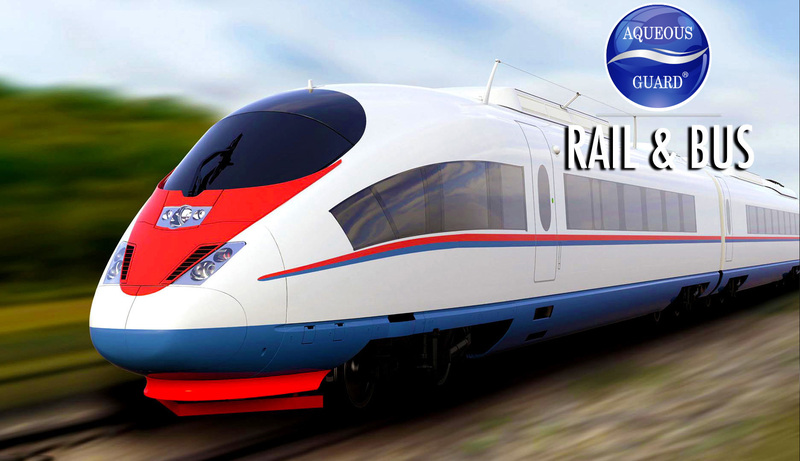 With the expertise, distribution and product control from Unipart Rail along with the durability of Aqueous Guard® Rail, we really are the no 1 in Rail coatings to offer a specialist product for your trains, either as product supply with full technical support or global application teams for the Rail market. A service you can trust. AQUEOUS GUARD® GLASS COAT	Thin liquid, Si02 coating to prevent chemical attack & water spotting, whilst increasing gloss, visibility, safety and creating a stain free water beading surface for: All glass surfaces. Application: specialist hand application. Warranty: 12 months except for wiper-blade areas at an average of 3-6 months. AQUEOUS GUARD® FABRIC & LEATHER COAT	Impregnating silane coating to prevent staining, creating a water beading surface for: All fabric & leather surfaces. Application: spray applied. Warranty: No warranty, lasts up to 12 months depending on wear. 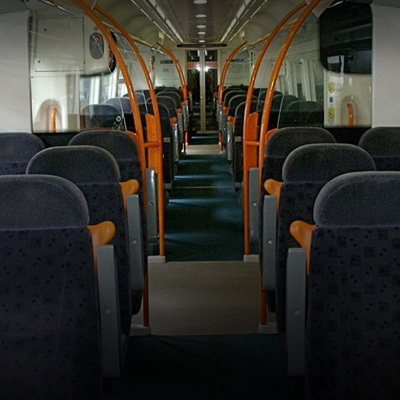 AQUEOUS GUARD® RAIL WASH	Rail Wash is a PH neutral, eco friendly, biodegradable rail wash, that effectively cleans carriages back to their former glory when Aqueous Guard™ protective coatings have been used. 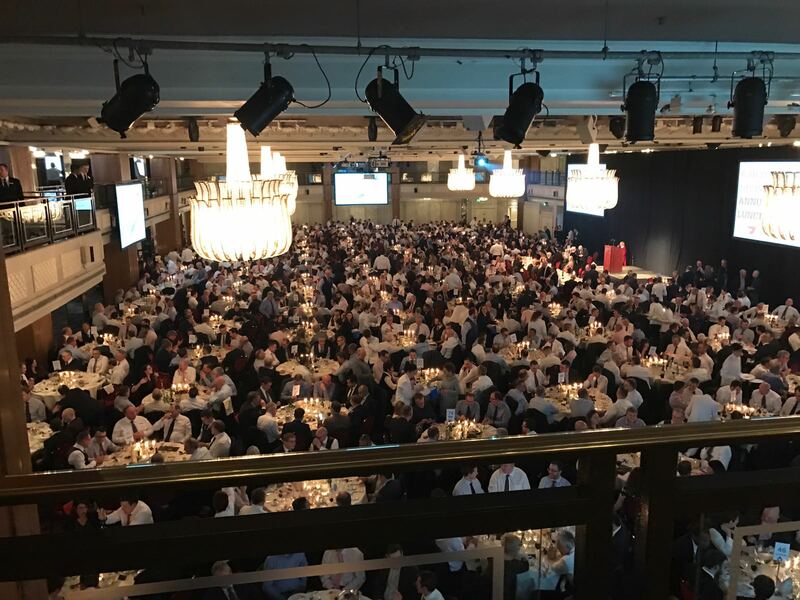 Application, Mechanical Wash.
Aqueous Guard® enjoyed a day out at the Railway division Annual Luncheon 2017 at the Grosvenor House. Thank you to Clemtech for their very kind invitation to the event. It was a great day to meet existing customers to broaden the relationships and discus the Rail Anti-Graffiti and easy maintenance ceramic protection coatings as well as meet new companies, helping to get our products in the market place both UK and world-wide. We look forward to next years event and progressing these relationships. Aqueous Guard® were proud to see the great success at Innotrans 2016 this year in Berlin with Unipart Rail. https://railway-news.com/aqueous-rail-guard-unipart-rail/ for full details on our impact at the show. Calling all our Rail connections, are you attending RailTex this week, please come and see us to see a live demonstration of our Aqueous Guard® protective coatings to cleaning and graffiti removal, along with a chance to enter our prize giveaway with details attached. Running in conjunction with our exclusive partners Unipart Rail. 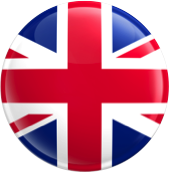 Aqueous Guard®, designed and manufactured in the UK by Revolutionary Protective Solutions Ltd, create specialist coatings providing a range of benefits over and above current coatings on the market. With a number of testimonials in each industry don’t take our word for it take our clients word for it. You can also see pictures and videos in our gallery section of the types of work carried out and the different industries we work in.